Houses that reflect physical or poetic qualities of a place become more powerful and memorable. Here are three ‘buildings in the landscape’ that respond to the uniqueness of their environment. Photos Simon Devitt. On the edge of a South Island lake, the folding forms of this architecturally-designed house camouflages itself amongst alpine grasslands. The architects’ approach was to investigate an architectural design language in conversation with the natural environment and local building traditions. Abstracted triangulated geometries and origami-like folds and cuts were employed to create a sculptural form that related strongly to the alpine landscape. The house articulates this with reference to the forms and textures of the vernacular timber woolsheds of the area. Central Otago in winter has a brittle climate of high altitude air, clear nights, snow and icy winds. The sky and mountains feel vast. 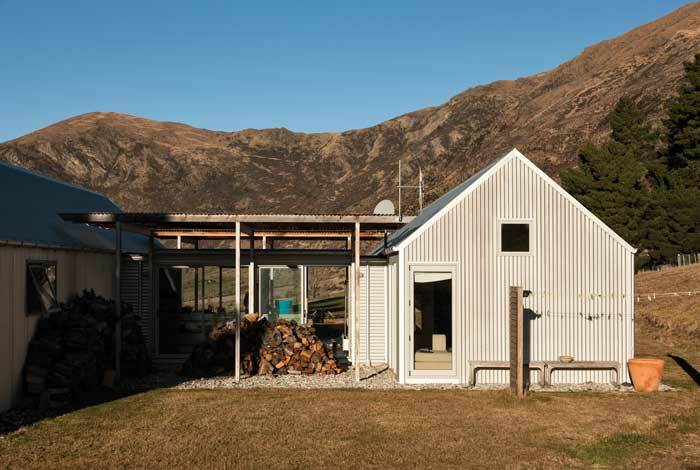 On this 300-acre sheep station between the Remarkables and the Crown Range, the architect has designed an H-plan house in a form reminiscent of traditional rural sheds. Incredibly practical and functional, its corrugated iron cladding and steep roof feel at home in the alpine landscape and climate. Read Designing houses for the cold by Kerr Ritchie. Overlooking a forest and steep valley, this plywood house lies along a sensitive ridgeline. It has been designed as a series of ‘huts’ connected by a protected walkway cut into the hill. Falls of rhyolite scatter the surrounding hillsides so the architects’ decided to cut into the site and arrange the pavilions along a walkway faced with a retaining wall of rhyolite boulders. It nestles sensitively into the site and recalls the simple forms of tramping huts, inspired by the owners’ love for the outdoors.